Note that Western Bay of Plenty Cricket Association uses slightly different names to NZC for each Division. These are explained below. Great introduction to cricket for beginners aged 4 - 7 years old that may not want to play a whole game. It is based around drills and skills with a short game at the end. 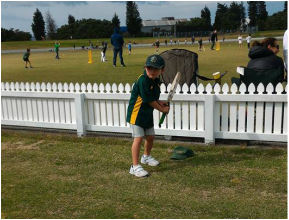 Our child-friendly coaches lead the fun sessions on the Bay Oval outfield from 4:00 - 5:00pm on Thursday afternoons. Our youngest cricketers. First season of soft ball kiwi cricket style rules. Six player teams, 12 overs per innings, with everybody getting an equal turn to bat, bowl, field and wicket keep. Pitch length 10m. Games are Saturday morning from 9:00 - 10:30am. Soft ball Cricket - 20 over games in teams of eight with 4 or 5 over batting partnerships. Everybody gets a turn to bat, bowl, field and wicket keep.​ Pitch length 14m. Games are Saturday mornings 9:00 - 11:30am. Hard ball cricket - 20 over games in teams of eight with 4 or 5 over batting partnerships. Everbody still gets equal opportunities to bat, and at least two overs of bowling. Pitch length 16m. Games are Saturday mornings from 9:00 - 11:45am. Hard ball cricket games up to 30 overs per innings in teams of nine. Every batter faces at least six balls. Everybody is encouraged to bowl as well, though players may have started to specialise in one or more roles by now. Pitch length 18m. Games are Saturday mornings 8:30am - 12:00 noon (reserve grade games are shorter). Most College cricketers play on Saturday afternoons in one of two grades, or in the adult's divisions for the higher-skilled from year 11 onward. Normal rules of cricket apply. There is also a more social midweek T20 competition played on Tuesday afternoons.